Learn why organizations need intelligence to protect against internal and external threats. Enabling NATO joint forces to achieve data to decision in minutes, and execute training operations with greater accuracy. Discover how i2 Enterprise Insight Analysis helps analysts discover events that are related. 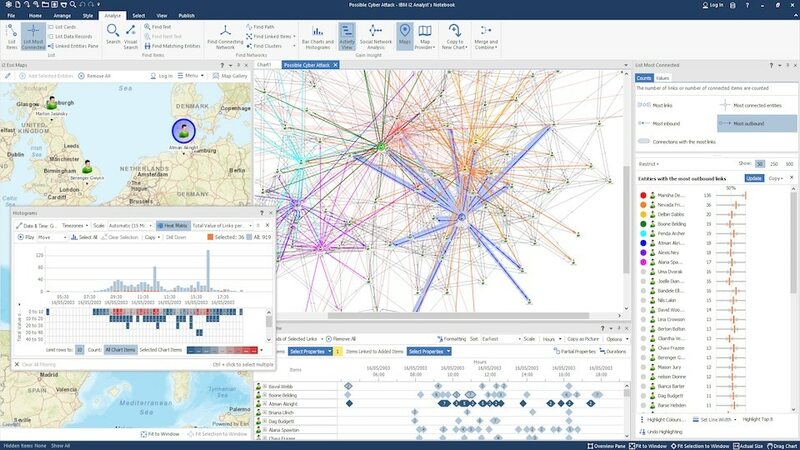 A powerful combination of visual tools and automated analytics helps analysts to quickly uncover patterns and connections. Learn how to turn large amounts of information into actionable intelligence for faster, more informed decision making. Counter and mitigate more attacks with cyber threat analysis. Integrate multidimensional analysis capabilities to quickly find hidden connections and patterns. Accelerate the data-to-decision process by rapidly transforming data into actionable intelligence. Threat hunting can significantly improve detection rates and accelerate time to detect, investigate and remediate threats. IBM i2 has been helping analysts outthink the bad guys for over 28 years. Learn more about the rapidly evolving use of advanced analytics in defense intelligence. Read how the use of advanced analytics generates powerful insights to stay ahead of evolving cyber threats. Vetting and monitoring capabilities are vital tools designed to help manage the safety of your borders. See how to identify vulnerabilities and threats across your enterprise. How secure is your enterprise from threats? Take this short security self-assessment, and find out if your enterprise is at-risk.